The team of professional pergolas carpenters and builders inSydney carpenters from Tandem Trades have been providing Sydney home owners with quality new-build pergolas that lead the way in terms of quality, design and value for money. 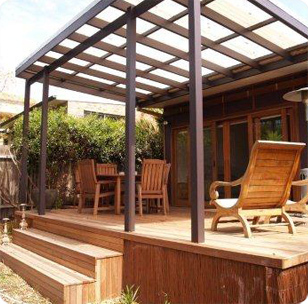 When your pergola is constructed by Tandem Trades - Licensed pergolas builders in the Sutherland Shire of Sydney, you can be confident that you will receive the same dependable service and commitment to quality that we have built our reputation on over the last 25 years. We service all of the greater Sydney region. We take the time and care to fully understand your needs to building a pergola that takes into consideration the style of your home, the lifestyle of your family and your budget. Along with an obligation free quote, we also stand by our work and offer a full guarantee on all work and materials. We offer residential, commercial and industrial new build pergolas services throughout the greater Sydney area including Sydney,Sutherland Shire,St George,Inner West and the Eastern Suburbs Sydney for all residential, commercial and industrial customers. For an obligation free quote, please contact us today for professional carpentry trade services.